Everyone has the gap between where they are and where they rightfully feel they should be. It’s the difference between being satisfied and dissatisfied with your job, your house, your relationship: That gap is everything, and the wider it is, the more painful it is. Now imagine the warped perception of movie stars, people who lived for years in the limelight and were treated like royalty: The difference between that status and what life is like once that is over stretches this gap into an absolute chasm. It explains why Joan Crawford fought so fervently to make What Ever Happened To Baby Jane in the first place, why she agreed to work with her arch-nemesis, why Bob Aldrich climbed on board in the hope of saving himself from a string of flops. They all know what Hollywood success looks like and in 1960, they were all far from it. Everything was riding on the success of Baby Jane, and when that film began to pay off, its ramifications, as we see in this episode, are staggering. The saddest fate belongs to Joan Crawford, who can barely enjoy her brief return to the spotlight, as she is outshone by Bette Davis, onscreen and off. It’s a bit staggering how much she shied away from the picture, especially since as Stanley Tucci points out in my favorite scene in this whole series so far, she has a financial stake in its success. But her rivalry with Davis makes this kind of championing impossible. What’s almost worse is Joan’s dismissal of Pauline and her script. Joan Crawford had to fight hard to get where she was, and maybe that’s why she’s still so insecure about it that she can’t be magnanimous or the slightest bit generous to the women around her, like Bette and Pauline. Joan’s stance is an indicator of how difficult it was to break out of these molds they were in. It’s been surmised that the character of Pauline actually represents a composite of women in Hollywood at the time, when the idea of a woman directing a film seemed outlandish. For all of Mamacita’s crowing about opportunities in America, there was quite a disparity for female directors like Ida Lupino. But even all men didn’t have the easiest time, which is why the story of Bob Aldrich might resonate as much as Joan’s this episode, in his meetings with Stanley Tucci (my Emmy contenders board is filling up rapidly this TV season). Aldrich, worn out from Baby Jane, wants to use it as a springboard to a more prestige picture. But he’s immediately saddled with the greatest diva of them all: Frank Sinatra. Most of all after making Baby Jane a hit, Bob wants to be considered great: by his peers, by Jack Warner. His ambition in his mind is that of a great director, capable of excellence—Warner coolly and cruelly cuts him to the quick. Same with Joan, and Warner’s confirmation that she’s not the actress that Davis is, although, as The New Yorker points out, Crawford was more of a magnificent screen presence, Davis the craftsman addicted to her work. So in Crawford’s mind, she deserves more greatness; Bob, to be a respected director (I like to think he eventually accomplished that with The Dirty Dozen); and Pauline, to be able to be a director at all. People who seem to care less have the power more: Warner, Sinatra, and Davis herself. It takes a fairly unself-conscious person to sing a undignified pop song rather poorly on The Andy Williams Show in the ’60s; ever the workhorse, and the star, she gladly tosses out Baby Jane dolls and does the talk-show circuit to promote the movie and herself. It’s surprising how much Davis is painted as the more level-headed player throughout Feud; also, how striking Susan Sarandon is in a role that’s less imitation than complete possession. Davis is willing to put out her own personal ad looking for work, to do Perry Mason, because it keeps her in the public eye and may lead to something, whereas Crawford would never stoop so low (although, as we know of her later career, she was about to stoop lower). The distance between who we are and who we want to be: The shorter it is, the happier we are. When Feud started, I loved it at first sight as a picture-perfect homage to classic Hollywood, an era I revere. I wasn’t expecting it to go as deep as it has, and I have with it. When Bob asks Warner those pointed questions, like him, I’m pierced. It also has a lot to do with where you are in your time of life: In your twenties or even thirties, it still seems possible that you still might knock out that great American novel, meet the perfect mate, and undoubtedly wind up with a cushy salary in the high six figures at some point. Once those decades pass, when you get to where our players are in Feud, you realize that the sum total of your life is coming up sooner than you could have possibly imagined. What will people say about you? What do you want them to say? And how much time do you have to pull that off? (Okay, I might have seen Hamilton this week.) So much of what we see on TV and movies is skewed to a certain (younger) age, that the later-middle-age of Joan, Bette, and Bob really resonates here: As Joan puts it, they all have only so many chances left. The situation leads to despair in Joan, despondency for Bob, and a new determination in Bette. And as we’ll see, they all pivoted that Baby Jane momentum into various degrees of success. I’m just glad we’re only halfway through this marvelous series. That’s Toby Huss doing a bangup Sinatra impression. 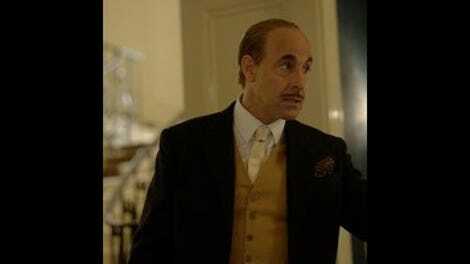 “Get out of my house!” I just get the feeling that Lange and Tucci had so much fun filming that scene, and it shows. I wish it was an hour long. Love how the final scene of Joan finding out about the Oscar nominations was set up just like a horror movie.